I love the diversity and all-purposefulness of the Coye Law Firm! "I searched online for a workers' compensation attorney and found Wade Coye. I liked his story and liked that he is a military veteran, because I come from a military family. His character seemed to align with my values." "This claim was my very first lawsuit, so I was worried that navigating the process would be uncomfortable. However, everyone on my case was attentive, and Cheyenne went above and beyond to get in touch with me in a timely manner." "I had contacted previous firms before but they made me feel unimportant. I got the impression that my injury wasn't taken seriously because it was 'just a tear' in my shoulder. At the Coye Law Firm I felt like I was being heard, and my injuries received the care and attention that they deserved." "I related to Atiya on a personal level because we both have similar backgrounds in education. 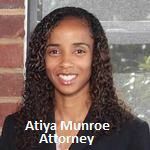 Most attorneys think they have to be prim and proper all the time, but Atiya gave me real talk. I enjoyed kicking it with her during my mediation. I give her a big thumbs-up!" "I would recommend the Coye Law Firm because they have the right resources and the right level of customer care. After a death in my family, I came home to find a bereavement card and brownies on my doorstep. I was really happy to see that because I knew that they cared." "I love the diversity and all-purposefulness of the Coye Law Firm. Everything is done in-house so I know I won't have to use three different attorneys for different matters."